Tuesday, March 11, 2014 by: Alan Phillips, J.D. (NaturalNews) California, Oregon and Washington State all have recently enacted new vaccine exemption laws making it harder for parents to exempt their children from mandatory vaccines required for school and daycare. Colorado's House Bill 14-1288, if passed, will follow this trend by adding a requirement that parents be educated about the risks and benefits of vaccines in order to exercise a non-medical vaccine exemption. Vaccine rights activists oppose this bill because the true risks are seldom acknowledged by health authorities, and because we believe that parents and adult students should be allowed to make their own, independent informed choice about vaccines, without pressure or coercion from anyone on any side of the issue. A Colorado activist recently presented a cover letter and Analysis of Colorado's exemption bill, written by Vaccine Rights Attorney Alan Phillips, J.D., to Colorado legislative committee members. The complete letter and Analysis, which make a compelling case against Colorado's HB 14-1288, are posted here. The Analysis is provided below. A. Parents have a Fourteenth Amendment Due Process Constitutional right to parent their children that includes medical decision-making. The state may not intervene unless there is a showing that the parent is unfit, or in case of emergency or imminent risk of harm. Regarding the latter, state laws allow intervention by appropriate medical or social worker authorities. HB 14-1288 unconstitutionally presumes that parents are unfit to make exemption decisions for their children. B. The religious exemption language in Section (3)(b) is flawed grammatically and legally. Grammatically, it is not possible to be an "adherent" to a "religious belief," and a "religious belief" doesn't "teach" anything; the current wording is unclear. Constitutionally, the First Amendment prohibits restricting a vaccine religious exemption to adherents of an organized religion. States may require only a sincerely held religious belief. C. The U.S. Supreme Court says vaccines are "unavoidably unsafe." No vaccine risk-benefit information can change that, nor would any such information be objectively accurate unless it stated that - which we can rest assured will never happen. A. Vaccines Cause Permanent Disabilities and Death. The Federal Vaccine Injury Compensation Program (VICP) pays out approximately $100,000,000 (one hundred million dollars) annually for vaccine injury and death - nearly $3 billion to date. No one can calculate the risk for any given child. Neither the state nor interested parties (doctors, etc.) can ethically promote such risks; yet, the intent of HB 14-1288 is that they do so vigorously. We do not require young adults to risk their lives for their country with the draft; yet, we require newborn infants to risk their lives with a Hepatitis B vaccine for a disease they have virtually no risk of contracting and cannot spread by casual contact, and the vaccine's protective effect will wear off before they are at risk of contracting the disease. B. The scope of vaccine injury and death is unknown. The FDA estimates that as few as 1% of serious adverse reactions to vaccines are reported. [4,5] The CDC admits that only about 10% are reported. Congressional testimony revealed that medical students are told not to report suspected adverse events, despite a law requiring doctors to report suspected vaccine adverse events. No one should ever be pressured to take a product from an industry that routinely engages in criminal behavior! D. Government health officials are not always truthful about vaccines. (1) In 1962, Dr. Bernard Greenberg, Biostatistics Dept. Head at the University of North Carolina School of Public Health, testified before Congress that cases of polio increased substantially after the first polio vaccine was introduced - 50% from 1957-58, and 80% from 1958-59 - and that the Public Health Service deliberately manipulated statistics to give the opposite impression. (2) In 2011, Co-Med (non-profit) obtained information via the Freedom of Information Act revealing that the CDC deliberately withheld data from publication showing that removing mercury from vaccines resulted in declining autism rates. (3) In April of 2011, Dr. Poul Thorsen, the principal coordinator of multiple studies funded by the CDC used to deny a vaccine-autism link, was indicted on 13 counts of fraud and 9 counts of money-laundering. E. Those designing and/or providing the risk-benefit information have conflicts of interest. They may profit from providing the information, may ignore or deny the risk of injury and death from vaccines under peer pressure, and may not inform parents in writing about the Vaccine Injury Compensation Program as required by federal law. F. Medical facts may be irrelevant to non-medical exemptions. Some philosophical objections concern non-quantifiable moral and ethical considerations not related to or refuted by vaccine risk-benefit information, such as the unquantifiable risk of vaccine injury and death (II. A. & B. above) and the large-scale routine criminal behavior of the vaccine manufacturing industry (II. C. above). (1)(a). Do vaccines really "save three million children's lives each year"? No. Childhood infectious diseases declined by 90 - 95% prior to the introduction of vaccines. Many diseases disappeared at the same time with no vaccine at all. Vaccines did not cause today's low disease rates, so there is no way to calculate lives saved, if any, by the continued widespread use of vaccines. In fact, according to the CDC, there are far more non-immune vaccinated children than exempt children. At least 5-15% of vaccinated children do not develop immunity (which the CDC admits is why most outbreaks occur in vaccinated children), while the national exemption rate averages 1.8%, and exempt children may develop natural immunity - and without even developing symptoms. The problem of infectious disease is not about exemptions. (b) Are vaccines cost-effective? There is no way to know with any precision, presently. Vaccine cost-effectiveness claims do not factor in the $100 million paid out annually for vaccine injury and death, and they can't factor in the 90-99% of serious adverse events that the FDA and CDC have said never get reported (see II A and B above). Until integrity is brought to vaccine adverse events reporting system (federal law requires doctors to report suspected adverse events, but Congressional testimony revealed that medical students are taught to not report such events), we can't know whether or not vaccines are cost-effective. (c) Are high rates of immunization coverage necessary? No. The majority of the U.S. population consists of "baby boomer" adults not vaccinated in decades (vaccine immunity lasts from 2 - 10 years); yet, disease outbreaks are not at all widespread. 90-95% of infectious disease decline preceded immunizations. Those diseases won't return without vaccines. (d) Do high exemption rates cause pertussis outbreaks? No. Recent research has shown that it is actually the pertussis vaccine, and not lack of immunizations, that has caused recent pertussis outbreaks across the U.S. Even the CDC admits this. (e) I neither agree nor disagree that 90% of exemptions are personal belief exemptions. However, for the reasons stated herein, this is not a concern. (f) I neither agree nor disagree that Colorado has one of the highest rates of personal belief exemptions. However, if true, this has not led to greater disease rates in Colorado than other states, and is not a reason for government to interfere with parents' decision about whether or not to risk injury or death to their child from immunizations. (g) Section (d) above refutes the assertion that states with easy exemption procedures have more infectious disease generally and that such procedures result in more whooping cough specifically. However, even if true, states with higher exemption rates necessarily also have lower vaccine injury and death rates. Furthermore, there are means of infectious disease prevention that are more effective and less costly than vaccines, and with no adverse events, that parents should be able to use. Presently, they are only denied this option because it is not profitable for the pharmaceutical industry. (h) A parent's vaccine decision carries great risks for the child, as the child could be permanently disabled or killed by the vaccine. However, a parent's vaccine decision carries little risk to other community members if vaccines really work and those members are vaccinated. Current law allows anyone who wants a vaccine to get one. For any and all of the above reasons, Colorado's present vaccine exemption law should remain unchanged, and HB 14-1288 not passed. Current law allows parents to selectively vaccinate as they and the healthcare professional of their choice may deem necessary and appropriate for each child, without biased interference from the state or healthcare professionals chosen by the state. In Troxel v. Granville, 530 U.S. 57 (2000), the Court stated: "The Fourteenth Amendment's Due Process Clause has a substantive component that 'provides heightened protection against government interference with certain fundamental rights and liberty interests,' including parents' fundamental right to make decisions concerning the care, custody, and control of their children . . . There is a presumption that fit parents act in their children's best interests; there is normally no reason for the State to inject itself into the private realm of the family to further question fit parents' ability to make the best decisions regarding their children [citations omitted]. See, e.g., Sherr and Levy vs. Northport East-Northport Union Free School District, 672 F. Supp. 81 (E.D.N.Y., 1987), Mason v. General Brown Cent. School Dist., 851 F.2d 47 (2nd Cir. 1988), Lewis v. Sobel, 710 F. Supp. 506 (S.D.N.Y. 1989), and Farina v. The Board of Education, 116 F. Supp.2d 503 (S.D.N.Y. 2000). Less than 1%, according to Barbara Fisher, citing former FDA Commissioner David Kessler, 1993, JAMA, in the Statement of the National Vaccine Information Center (NVIC), Hearing of the House Subcommittee on Criminal Justice, Drug Policy and Human Resources, "Compensating Vaccine Injuries: Are Reforms Needed?" September 28, 1999. Less than 10%, according to KM Severyn, R.Ph., Ph.D. in the Dayton Daily News, May 28, 1993. 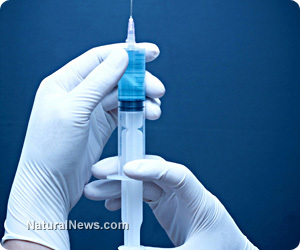 "Mandating Vaccines: Government Practicing Medicine Without a License?" Jane Orient, M.D., Director of the American Association of Physicians and Surgeons, 1999. 42 U.S.C. § 300aa-25. Recoding and Reporting Information, National Vaccine Injury Compensation Program. National Vaccine Injury Compensation Program, Subpart c. Assuring a Safer Childhood Vaccination Program in United States, 42 U.S.C. § 300aa-26. Vaccine Information.